In China, Obama Touts Visa Deal, Progress On Free-Trade Pact : The Two-Way Under a new agreement, the U.S. and China will extend visas from the current one-year term to five and 10 years. 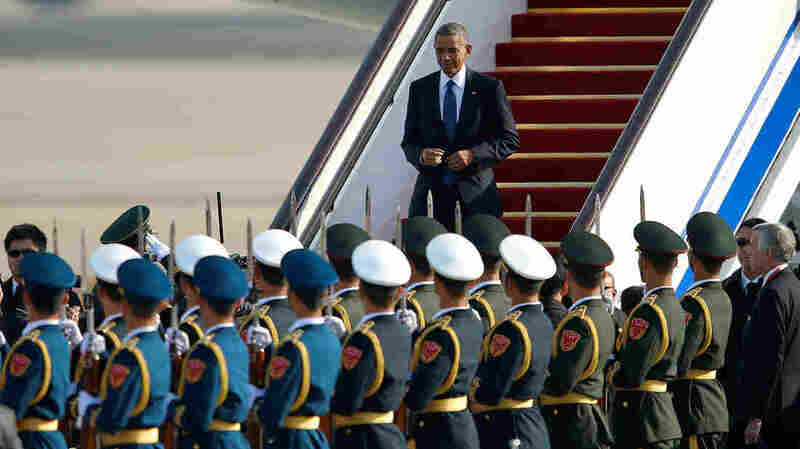 President Obama is in China for the Asia-Pacific Economic Cooperation forum. President Obama arrives at the Beijing airport Monday. Speaking at the APEC summit, the president unveiled a new deal to ease visa restrictions between the U.S. and China. The U.S. and China are easing visa rules for each other's citizens, in a reciprocal agreement that President Obama says will "benefit everyone from students, to tourists, to businesses large and small." Starting his eight-day visit to East Asia, the president also said "good progress" has recently been made for a free-trade agreement among Pacific Rim countries. Obama and other leaders are visiting China for the Asia-Pacific Economic Cooperation forum, where the president announced the U.S. and China have agreed to expand their visas beyond the current one-year term. "Under the new arrangement, student and exchange visas will be extended to five years," Obama said in a speech at the APEC sessions, adding, "business and tourist visas will be extended to 10 years." The White House predicts that the deal will boost the U.S. tourism industry, noting that "Chinese travelers persistently rank the United States as their top desired travel destination, but only slightly more than 1.8 percent of total outbound travelers go to the United States." One goal of the new policy, the administration says, is to make it easier for tourists from the "fastest-growing outbound tourism market in the world" to visit America. According to a fact sheet about the new rules, "In 2013, 1.8 million Chinese travelers visited the United States, contributing $21.1 billion to the U.S. economy and supporting more than 109,000 U.S. jobs." Monday, President Obama also said "good progress" has recently been made toward finalizing the Trans-Pacific Partnership, a free-trade agreement among the U.S. and 11 other Pacific Rim countries. Obama's statement came as the U.S. hosted leaders of those 11 nations at the U.S. embassy in Beijing. The potential trade group does not include China — a detail that illustrates the balancing act of competitive engagement that in many ways defines the two countries' relationship. "Negotiators have been working for years to finalize the Pacific trade agreement. And while no final deal is expected during this week's meeting, President Obama says he hopes he and his fellow leaders can break some of the remaining logjams. "Prospects for a trade deal may have been strengthened by Democrats' losses in last week's midterm elections. Newly empowered Republicans in Congress say trade is one area where they think they can find common ground with the president." "Taken together, APEC economies account for about 40 percent of the world's population, and nearly 60 percent of its GDP. That means we're home to nearly 3 billion customers, and three-fifths of the global economy. "And over the next five years, nearly half of all economic growth outside the United States is projected to come from right here, in Asia. That makes this region an incredible opportunity for creating jobs and economic growth in the United States. And any serious leader in America, whether in politics or in commerce, recognizes that fact."